Sean Rafferty is taken to the ‘Sterbewohnung’, the house where Schubert spent his final days and where he composed some of his greatest works, and goes to the Zentralfriedhof where Schubert is buried. Sean Rafferty sees grisly evidence of Schubert’s syphilitic condition with Dr Beatrix Patzak, director of the Federal Pathology and Anatomy Museum, and hears about the symptoms, progress and treatment of the disease. In the eight and final episode of The Schubert Lab, Tom Service tries to answer the question: Is Schubert's final year an end or a begining? 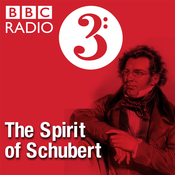 Romance proved difficult for Schubert - he stood barely five feet tall, with a long oval face and a deeply cleft chin. In turning to the streets of 19th century Vienna, "a night in the arms of Venus lead to a lifetime on Mercury" Whilst uncertainty exists about the cause of Schubert's death from syphilis, what do his attempts at mercury remedies reveal about his final few years? The medical historian and author of Romanticism and the Sciences Andrew Cunningham, examines The UnRomantic death of the mercurial Schubert.